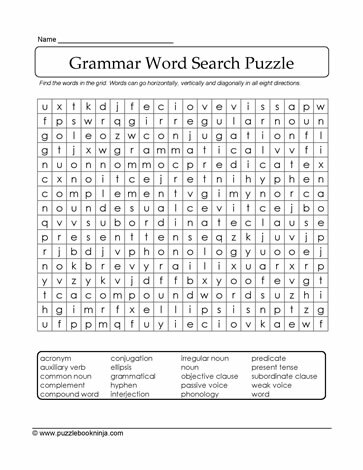 Help students build academic vocabulary through this grammar words printable word search puzzle. Suitable for students in elementary grades 4,5,6 classrooms and the home schooling environment. Challenge family, friends and classmates to see who can be the first to complete these free word find puzzles. Possible curriculum extensions for this printable puzzle might include: 1. reading and writing: have students identify the meaning of the grammar words; 2. drama: model the concept through tableaux; 3. drama: create a skit about some of the grammar concepts; or 4. art: draw cartoons of characters using acronyms, sub-ordinate clauses, interjections.